Let Beadwork magazine guide you on your next beading adventure! Enjoy bead weaving patterns, expert tips and tricks, inspiration and more as you advance your beading skills. Beadwork comes out every two months, with plenty of in-depth information and guides on how to take your beading skills to the next level. Each issue of our leading bead magazine is jam-packed with all the latest and greatest new bead weaving and bead making guides, so it’s a wonderful resource for longtime beaders and newbies alike. 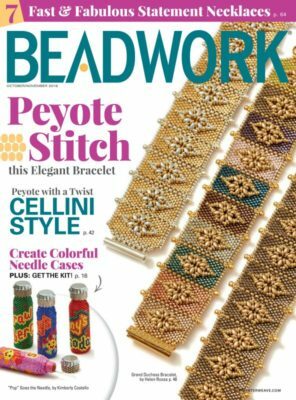 Beadwork magazine projects are perfect for helping crafters at all levels find the best new ideas for their skill set and personal style. Enjoy tons of wonderful necklaces, bracelets, rings, brooches, pins, home décor and more that helps you showcase your beaded work. It’s all available in every single issue of Beadwork, which you can get delivered to your door six times a year or soak up through back issues and digital downloads. Check out the current issue to see all that Beadwork has to offer! Ready to subscribe? Interweave publishes six issues of Beadwork annually, and every one is full of the bead patterns and designs to inspire you. You can also purchase back issues of our popular bead jewelry magazines at Interweave. Stock up on issues that pique your interest or find a single issue featuring a particularly interesting article or guide that gets your creative juices flowing. At Interweave, we publish our magazines in both print and digital formats, so you can read them in the way that’s most comfortable to you. We make every effort to ensure that our products don’t leave our walls with any errors. When we do make mistakes, we make an effort to fix them as quickly as possible. To view errata for our beading products, please visit the errata section.